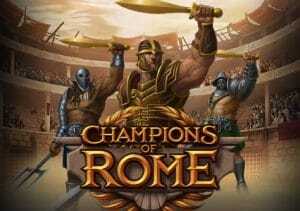 Head to the coliseum and do battle with a band of fearsome gladiators in Champions of Rome. Created by Yggdrasil Gaming, this 5 reel, 20 payline video slot looks and sounds superb and comes with features to match. Look out for weapons that can deliver wild patterns and a pair of free spin rounds where multipliers of up to 4x are on offer if you’re feeling brave. Play on your PC, tablet or mobile device from between 20p and £100 per spin. As usual for an Yggdrasil Gaming video slot, the design here is terrific. We’ve seen fewer better looking games than Champions of Rome. With the crowded stands of the coliseum in the background, the reels are set within a pair of marble pillars. There you’ll find 4 lower value coins, 3 stone gargoyles and 3 top paying gladiators. The best of this muscular trio will get you 2, 6 or 60 times your bet if you land 3, 4 or 5 in combination. Swords – 1×2 and 2×1 wilds. Mace – A block of 2×2 wilds. Trident – 4 single wilds. Once the new wilds are in position, a payout calculation is made. Land 3, 4 or 5 free spin symbols and you’ll be in line for an award of 1, 15 or 600 times your total bet. You’ll also be offered the pick of 2 free spin rounds. You have the Training Free Spins feature. On offer here are 8 free spins – all winnings are yours to keep. This is the higher risk, higher reward option. If you don’t manage to amass a win of 22.5 times your bet, then you’re winnings are wiped out. All you’ll get is a consolation prizes of between 2 and 10 times your bet or 5 free spins in the Training Mode Free Spins feature. The gladiators are central to the action during both free spins. All of the higher value symbols are replaced by a gladiator. That gladiator’s weapon strikes on each free spin and delivers its associated wild combination. Also entering the fray during the free spins is the Beast symbol. If the gladiator’s weapon strikes the Beast, you’ll get an extra free spin. With its superb sound and visuals and exciting features, this is one of the best Roman-themed slot games we’ve seen. The design is as good as you’ll find anywhere and the wild extras and multi-variance free spins round serve up plenty of action. You can win up to 4,800 times your bet on each deathmatch free spin with the potential 4x multiplier. Even if you’re not usually a fan of the historical, classical era video slot, you should find plenty to like in the impressive Champions of Rome. I also suggest you try Tiger’s Glory from Quickspin and Gladiator Road to Rome by Playtech which has similar themes.